There is a highly disturbing report out of the Federal Election Commission that, again, raises the inclination of some commissioners to curtail free speech under loose regulatory standards. A recent report indicates that two top Democrats voted to investigate former Republican presidential candidate Mike Huckabee for what their own staff viewed as an obvious joke. 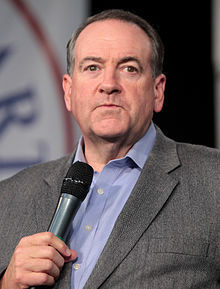 In the video, Huckabee (available here) clearly is joking in a speech when he said that he hoped supporters would shower him with million dollar contributions. Indeed, if Huckabee was going to violate federal law, he would hardly have done it in an open speech. Yet, Commissioners Ann Ravel and Ellen Weintraub still threw common sense (and respect for free speech) out the window in backing a complaint against Huckabee. Nevertheless, the two Democratic Commissioners wanted Huckabee investigated for seeking donations above the legal limits of $2,700. The vote reaffirms the long-standing view among many that the FEC is composed of highly partisan members selected by the two rivaling parties to do their respective bidding. It is chilling to see two FCC commissioners willing to launch a formal investigation for such a trivial and transparent joke. Great. Now the FCC is a political arm used to harass the opposing party. I wonder if a Republican becomes President, if we’ll just throw in the towel and harass Democrats with the FCC and the IRS for 4 years, then Republicans, then Democrats. It’ll be hard to keep track of who we’re oppressing with government agencies purely on the basis of politics. This is how you become a banana republic. Oh, but wait, some will say this is just fine because they agree with the politics. Like those that blew off smashing an egg in a woman’s face, punching a guy in a wheelchair, hitting a man in the head, etc because they dared to go to a Trump rally. I don’t like Trump, but it’s outrageous how we have managed to create a State Party. Unless you are not only a Democrat, but a Liberal, you are unwelcome at universities, professors will assault you, if you speak an opinion you may be fired or lose your business, the IRS and the FCC will target you, and you’re a racist/chauvinist if you object to anything. We’ve gone howling mad to allow this to happen. This statement by Supreme Court Justice Sonia Soromayor only solidifies what Donald Trump is claiming that a judge who is a member of and contributor of an activist group called LaRaza and so is Sotomayor. That statement proves Donald Trump is right. . . that a judge’s race is used to affect a case before them. This Huckabee deal will be happening more and more by the liberal left. Bill Clinton did say he does not fault those who raise questions about the donations. “I don’t blame whoever saw that [Algeria story] reported for asking the question about it, because they would have no way of knowing the context,” he said. As reported, Algeria is one of six countries that donated to the Clinton Foundation and received weapons deals from Hillary Clinton’s State Department at the same time the department was criticizing its record on human rights. Where’s the outrage, the news coverage and the investigations? We have a presidential candidate who is participating in influence peddling through her government job. There’s more outrage over another presidential candidate mentioning a obvious judges LaRaza bias against a man who is against ILLEGAL immigration in a civil case, when the original plaintiff was dismissed. There was no law broken by stating the obvious but the other breaks the law and we hear crickets!!!!!!! This is very scary. In this act we see yet another result of loss of the rule of law in the US. Having only the rule of fiat, people will be gone after for displeasing those who have more power. These commissioners should be fired, yet they will stay in their job and do the bidding of their superiors, punishing those who have displeased the powerful, ignoring glaring wrongdoing by the most powerful. We live in dangerous times and the powerful are striking down their enemies (including ordinary people, the earth and all its lifeforms). It is the rise of the police state, fully functional, with no breaks such as of the rule of law. Paul, Exactly! And, it does look like Huck has ballooned back up to 350lbs. I wish this was the worst thing this group has done. Huckabee shoud be investigated but those who have been kissing the rings of the Kochs and Adelson, et al don’t get investigated? Keep the ugly dogs off the blog. Sorry dogs. I don’t really mean to offend dogs. Ok. Keep the ugly hogs off the blog. It is too early for such photos. And please, please wait til noon before rolling out ugly Hillary photos. This is an example of why Civil Service protections are so important for federal employees. A lot of people don’t understand that the reason for civil service protections are so that independent, non-political employees can make a fair assessment of a situation without being forced to yield to management or political appointees with partisan interests. If the political hacks have the power to over-rule the staff, so be it. But at least the staff can issue a non-biased report for all to see without fear of retaliation. Unless you want to be a martyr…stfu…they will toss you in jail and try to kill you there. Do not fuxk with tptb….you will get tossed in jail….denied food water and hygiene. I am telling you chill your speech. You will be left to die in jail. Hopefully these two political morons should have to personally pay for the cost of such an investigation. Why should the tax payers have to pay for their stupidity? This is pure stupidity, what should be investigated is to have lobotomies preformed on these two political morons to see if they even have one brain between them. Or, at the very least these two idiots need to personally pay the total cost of such an investigation. Huckabee: another “evangelist” war-mongering Israel-firster neo-con scum. Nothing equates to proofreading. Sloppy writing. If you need a proofreader, my rates are reasonable. This is ANOTHER of Obama’s Regime and Agencies USING these agencies to Exact ‘verbal punishment AGAINST their Opposition/Perceived Enemies. They sic these agencies onto Honest, Americans, to ‘punish, silence and remove them from the scene, as they ONLY want their OWN Agenda to be on the lips of Americans. This is like Russia, where Free Speech is Punishable, and Obama Uses HIS Dictatorial Reign/and Crooked Regime(per his Marxist, Saul Alinsky teachings) to Punish his Enemies. Someone Should have told this man, he was elected to be POTUS of ALL THE PEOPLE-NOT JUST HIS VOTER BASE, OR FAVORED PEOPLE. Having partisan hacks in any commission relating to elections is a recipe for cronyism and ill influence. Some believe that having a balance of Republicans and Democrats on the commission results in fairness. It does not. It simply applies poles for which the commission can gravitate toward. Ideally, members of this commission should be removed from political parties or their influence. Moreover, there is a vested interest in both flavors of the duopoly to disenfranchise a third party that enters the political arena. To what end?Waste Of Tax money.